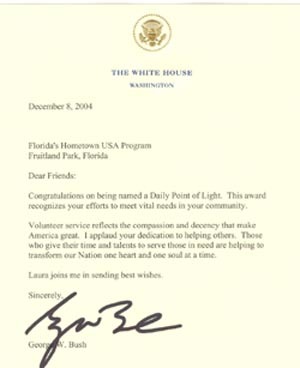 GOVERNOR BUSH PRESENTS POINTS OF LIGHT AWARD TO FLORIDA'S HOMETOWN U.S.A. 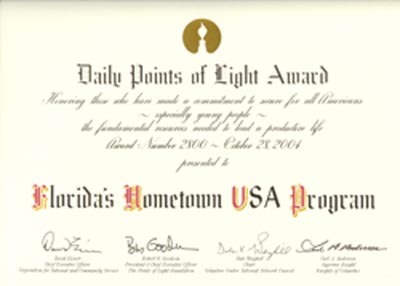 PROGRAM, INC.
"The Points of Light Award recognizes exemplary volunteers in Florida communities." Governor Jeb Bush recognized Florida's Hometown U.S.A. 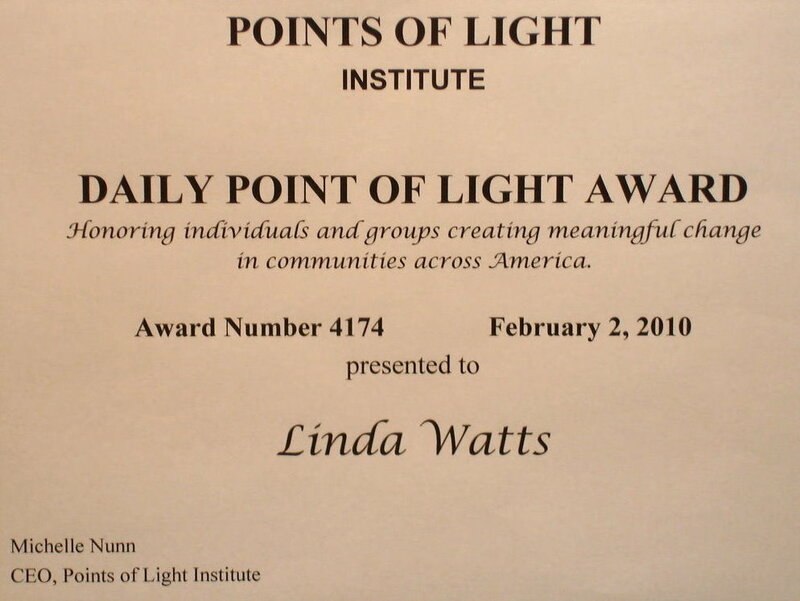 Program, Inc. as a Points of Light Award recipient. 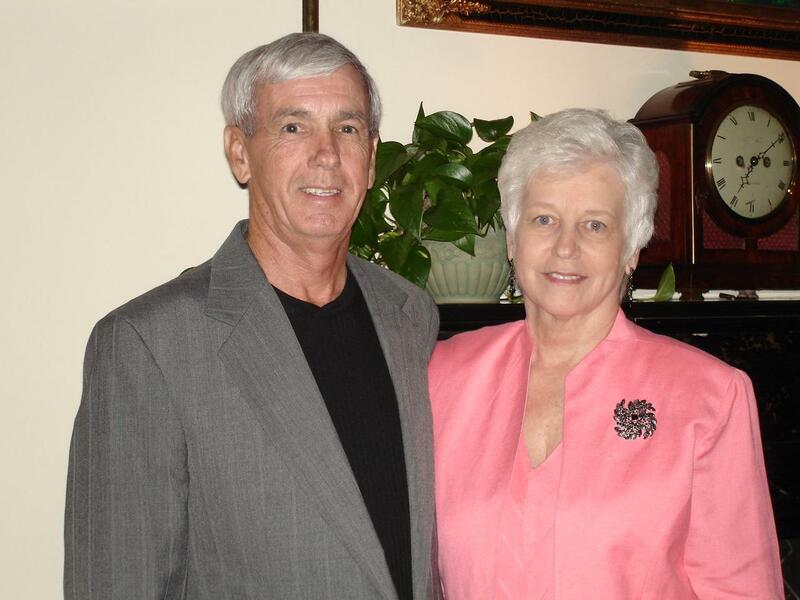 The weekly award recognizes exemplary volunteer and community service throughout the state. "Florida's Hometown U.S.A. Program is instilling the traditions of civic engagement for the youth of our state, Governor Bush said. "This valuable learning experience is a superb opportunity for young people to see firsthand the positive effects of giving back to their community." Florida's Hometown U.S.A. Program, Inc. was established in 1986 as an educational initiative to teach Florida's youth the importance of volunteer service. Students from around the state are selected to participate in this program each year. The program's mission is to make a positive difference in the lives of Florida's youth and to assist them in achieving their highest potential as they grow to become confident and caring individuals who show a commitment to volunteer work, leadership and standards of excellence. Students travel around the state visiting, entertaining and giving gifts to patients in children's hospitals and nursing homes. Students also participate in food and toy drives, and organize an Adopt a Grandparent program at local nursing homes in their city. Each year, the students visit Tallahassee, Washington, D.C. or New York City to learn more about the importance of civic engagement within their communities and their nation. "Working with the youth of Florida is an opportunity to teach the values of volunteering and for them to learn that as it continues year after year, it will have a lasting affect on many people," says Linda Watts, Director of Florida's Hometown U.S.A. Program. "Many of the students that have been a part of this program will continue to volunteer for years to come because of what was taught to them at an early age." 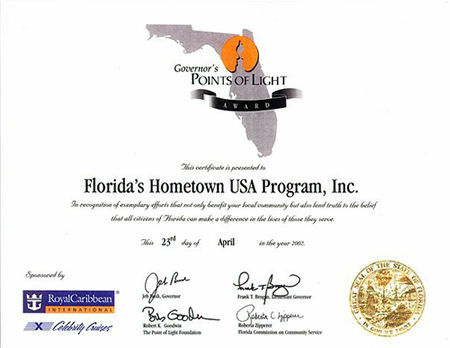 The Governor's Points of Light Award recognizes a Florida resident or organization that demonstrates exemplary service to the community.